Now that the Dow-Jones Average has climbed above 12,000, you probably feel a bit better about taking risks. But where should you put your money? Just how safe is aggressive investment, anyway? If you want to rebuild your portfolio after the losses of the past few years, here's your essential guide to investing in high-performance stocks. The authors list detailed information on potentially top-yielding stocks, along with suggestions on how to balance your portfolio to minimize exposure and ensure the best possible returns. Here you'll find information on how to define an aggressive stock, what to watch for in financials, managing risk with a tiered portfolio, how to play tailwinds, and the most important parts of your buying decisions. Today, the market is surging. Investors are watching attentively, ready to jump. Now you can dive in on the next big thing. This book will guide you safely to it. Peter Sander is the author of seventeen books and numerous articles dealing with investment strategies. 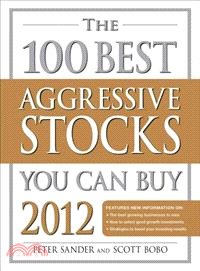 He is the coauthor of The Best 100 Stocks You Can Buy 2011. Scott Bobo is a professional engineer and researcher in the consumer electronics, personal computer, and semiconductor industries. He served as lead researcher for the 2010 and 2011 editions of The 100 Best Stocks You Can Buy.